This week was... interesting. After struggling with the morning sickness last week and losing a bit of weight, the unisom + B6 was a miracle for me! But early on this week, I suddenly started feeling sick. Really sick! You can tell I'm not feeling well in my weekly photo as well. It all started the day I was going for my blood work that my midwife had ordered. I just felt so off. I woke up with the chills and shivering. In hindsight, that should have been my first clue that something was wrong. But I didn't think anything of it at the time. By the end of the day, I couldn't keep anything down. I felt so sick! I thought it must be morning sickness. I kept feeling worse & worse. I kept wondering if I had developed that severe form of morning sickness. But my husband was really suspicious once he heard me mention the chills. I kept feeling burning hot and then was overcome by horrible chills. He was right to be suspicious... I had a stomach flu! This totally terrified me. I called both my midwife office and my RE. I was told to just make sure to control the fever and prevent dehydration. Not to worry about food or prenatals right now. I had to take tylenol for the fever. Ugh. I felt SO awful for the entire week. The worst of it lasted about 48 hours, but I really was sick for a whole week. I'm sure some of you have experienced being really sick, where it almost pushes you to the edge of your sanity. That is what this felt like! Towards the end of the week, when I was able to think a little more clearly... I started to really worry about our baby. Had the fever done something to them? I decided to try my home fetal heart monitor that I had gotten recently, but hadn't been able to find the heartbeat yet. Well, I'm happy to report... we found the heartbeat at home!! It was music to our ears and proof that our little one was doing well despite how ill I was. 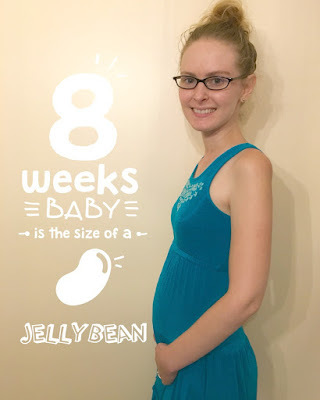 7 Weeks Pregnant + First Ultrasound! !